Environmental Law for Practitioners is an invaluable, practice-related introduction to environmental law in Germany, written by specialist legal advisers with extensive experience in the practical application of environmental law. This wholly revised second edition takes account of recent developments in rapidly changing environmental legislation and case-law. It is essential reading for foreign investors as well as providing swift, ready access to legal provisions and terms in both German and English. 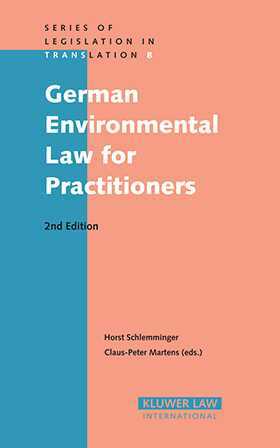 The book comprises an English description of environmental law in Germany and a bilingual compilation of the most important environmental statute texts. After a brief introduction to German environmental law and a short discussion of the legal bases and principles, fundamental aspects of significant interest to foreign investors are examined. The regulation of environmentally relevant activities is explained in a clear, concise way. Responsibility for residual pollution is discussed in detail. The book also provides a clear overview of both environmental private law and environmental criminal law, focussing on new developments relevant to investors and outlining recent trends in environmental litigation. In addition, environmental levies and their practical application as a formative instrument of environmental policy are described. The relationship between environmental law and contract is also explored. Finally, the authors look at environmental management systems and access to environmental information. The bilingual statute texts make vital legislation on the pollution and protection of the environment available to advisers and investors alike. Regulation of Environmentally Relevant Activities. Instruments of Civil Law (Environmental Private Law). Transparent Enterprises: Access to Environmental Information.